Fierce. Primal. Pure. This is the goddess Artemis, as seen by her modern worshipers. In this unique collection of essays, poetry, fiction, accounts of personal experiences and other forms of devotional writing, the wild one of the forest, the mistress of the hunt and the protector of young life – both animal and human – is shown to be a powerful and living goddess, just as important today as she was over 3,000 years ago in Greece, Rome, Asia Minor and other parts of the ancient world. You will be challenged, inspired, informed and entertained. Above all, you will come away with a new appreciation for this complex and dynamic deity who is, along with her votaries … Unbound. Unbound can be purchased from Amazon here or through Barnes and Noble here. All of the proceeds from Unbound – as well as many of the other volumes in the Bibliotheca Alexandrina series – will be used to help promote the revival of the worship of the Greek and Egyptian Gods, with a portion of the proceeds given to a worthy charitable organization in their name. So, not only will you be getting a wonderful book about the modern worship of Artemis – but your money will be going to do good work and help the revival of ancient polytheistic religions. 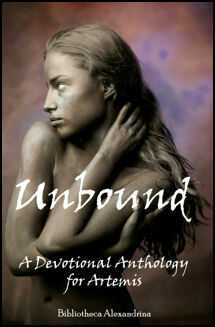 ATTENTION BOOKSELLERS: If you would like to carry Unbound in your store please contact us. We are willing to sell you copies of the book at a significant discount in order to make it easier to distribute Unbound as widely as possible. Please direct any inquiries to baeditor@gmail.com for more details. Read the reviews at GoodReads and Amazon and check out the interview with Thista Minai on Sequential Tart.